Access your body’s natural ability to heal itself. PRP, or Platelet Rich Plasma, is a substance that comes from your own body which can stimulate the healing process and promote tissue regeneration. To begin PRP therapy, a qualified medical professional will draw your blood and place it in a centrifuge for 15 minutes to isolate its platelets. We then use that platelet-rich substance to enhance aesthetic results where its healing properties are needed. PRP treatment is a great solution for improving skin texture and tone with minimal or no downtime. Given either as a an injection (PRP facelift) or applied in tandem with a Dermapen™ microneedling treatment, PRP penetrates skin to stimulate collagen production and healing. While other skin products or injectables might cause sensitivity reactions, even the most sensitive patients have no problem with PRP—it’s coming from their own body! 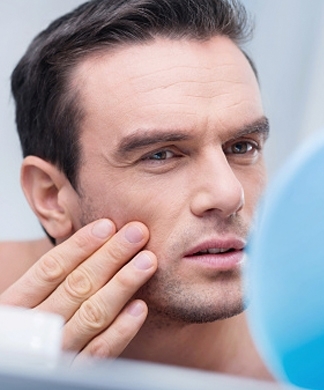 PRP has shown tremendous results for acne scarring, fine lines, and volume loss. Depending on your needs, we’ll determine whether injections or a PRP facial is the best choice for you. The concentrated platelets in PRP contain proteins and growth factors which help increase circulation to the hair follicles, stimulating the follicles to grow, and even thickening the hair shaft. It is believed that the introduction of platelets and white blood cells through platelet rich plasma can actually stimulate the growth of follicles, thereby reversing hair miniaturization seen in androgenetic alopecia and even preventing hair loss. After we obtain the PRP, the scalp is cleaned and numbed with a topical anesthetic. Calcium-activated PRP is injected via syringe and applied topically with a micro-dermaroller. The dermaroller creates microscopic channels that allow the PRP to penetrate deep into the scalp, where it stimulates hair growth. As a stand-alone treatment, PRP has been shown to help people with male and female pattern hair loss decelerate the hair loss process. It’s even been shown to make finer hairs thicker. If you think PRP treatment on the face or hair might be right for you, our medical team will give you a comprehensive free consultation to confirm that you’re a good candidate for the service. We’ll also address other aesthetic concerns with synergistic treatments that can improve your overall appearance. Since no cosmetic regimen is “one-size-fits-all,” we approach every patient with a customized plan to reach your specific goals. For PRP facials, pain may be associated with the initial blood draw and with the microneedling process, but this varies from patient to patient. Many patients find the discomfort associated with the microneedling portion of treatment very minimal. For the hair, PRP treatment will involve the blood draw and injections into the scalp, which can be painful. We apply a topical numbing agent to the area 30 minutes prior to treatment to help alleviate any discomfort. How long will treatment with PRP take? Platelet-Rich Plasma therapy is done in an exam room and takes around 60-90 minutes, depending on complexity. The patient’s blood is drawn and placed in a centrifuge for 15 minutes to isolate the platelets. The platelet-rich plasma is then injected into the area of treatment for hair restoration, or spread on the face while microneedling is done. How long will it take to see results from platelet rich plasma therapy? Improvement of skin texture and tone can be noticeable within three weeks of PRP treatment and improvement continues for the next 8 months as more collagen and keratin is laid under skin. Improvements in hair growth will be gradual and can be seen over a number of months and treatments. For the best results on the face, we recommend three treatments spaced 4-6 weeks apart. Hair treatments should continue for as long as you feel they’re needed. We’ll work with you to determine the best course of treatment. How long will treatment with PRP last? The results from PRP injected into the face or scalp can last for 2 years, or even longer. A PRP facial is more of a short-term treatment, but regular facials can improve skin’s texture and tone for the long term. Role of Platelet-rich Plasma in the Management of Androgenetic Alopecia. Autologous platelet-rich plasma: a potential therapeutic tool for promoting hair growth. Can Platelet-rich Plasma Be Used for Skin Rejuvenation? Evaluation of Effects of Platelet-rich Plasma on Human Dermal Fibroblast. The Effects of Platelet-Rich Plasma on Recovery Time and Aesthetic Outcome in Facial Rejuvenation: Preliminary Retrospective Observations. Platelet-rich plasma (PRP) treatment shows potential for knee osteoarthritis. Platelet-Rich Plasma: Support for Its Use in Wound Healing. Platelet-rich Plasma: Properties and Clinical Applications. The efficacy of platelet-rich plasma in the treatment of symptomatic knee osteoarthritis: a systematic review with quantitative synthesis.